Here is a collection of photographs of my daytrips to Essex in Autumn 2018. I have been busy working on the brand new edition of the Derelict London Book (published by Penguin Random House for release in June 2019) and I am keeping back most of the photographed London content exclusively for the book. So here is a brand new section just edging outside of the London boundary north of the Thames. These are my random wanderings around Essex mainly around the River Thames and whilst I do many guided walking tours around Derelict London/London's Lost Rivers/ London' s Lost Music Venues I am unlikely to be taking any public tours into Essex. I have many new London walking tours planned for 2019 and since 2013 every walk has sold out far in advance. To get the heads up on these dates send your email details over via the Contact page. Cheers! ​Purfleet is just outside the Greater London boundary between the A13 to the north and the River Thames to the south and is within the easterly bounds of the M25 motorway. In the 18th Century, Purfleet Royal Gunpowder Magazine was established as a location for the storage of gunpowder together with a garrison to protect it. J.M.W. Turner (1775-1851) made sketches of Purfleet in 1805-08 mainly featuring the Powder Magazines. The Royal Opera House has built its production centre in Purfleet. Purfleet was the location of Carfax House in Dracula and in the 18th century. Purfleet in the Thames Gateway, Europe's largest regeneration area & there is currently a £1billion regeneration of Purfleet project on a site covering an area of 155 acres which involves the demolition of existing buildings and other structures, site preparation of derelict scrubland, and the development of up to 2,850 dwelling houses. A petition has recently been launched to change the name of Purfleet, to Purfleet-on-Thames, in a bid to improve regeneration and business in the area. There is also a counter campaign called Keep Purfleet As Purfleet. A reader of Thurrock Gazette commented that it should be called Purfleet on Benefits. The regeneration scheme will result in the demolition of Botany Cottages & Railway Cottages. The now vacant Botany Cottages were built in 1905 as housing for workers by the Steamship Coal Owners Association. ​​This chapel was built in 1791 in a chalk quarry known as Church Hollow or The Dipping. The quarry owner, Samuel Whitbread owned and maintained it and required their workers to attend. The Methodist circuit preachers were gradually replaced by Protestants and the building was used mainly for Anglican worship,refurbished in 1855 and about 1863 it was put under the care of the vicar. 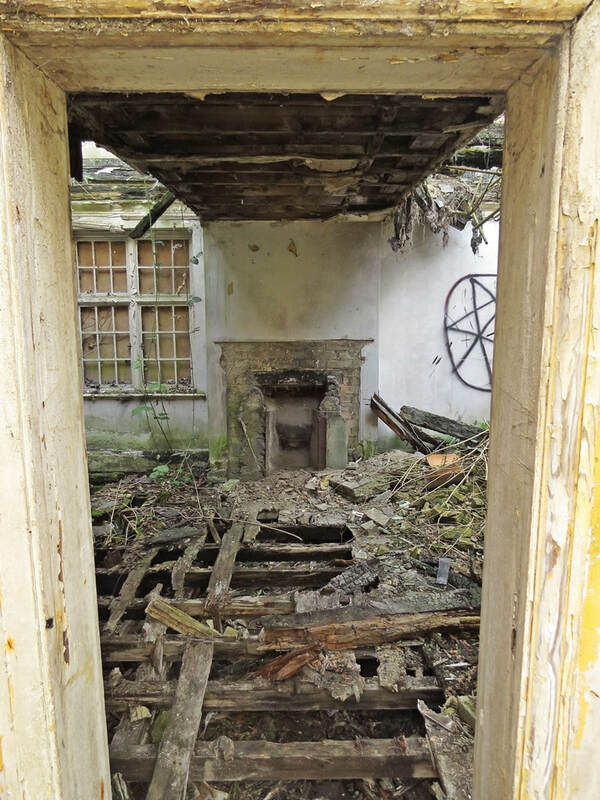 It became residential in the 1920s and was known as Church House.After suffering a fire in 2001 it is now in an appalling condition as you can see by these photographs. English Heritage describe it as vulnerable and in a dilapidated condition. It is Grade II listed. The quarry was used as an oil storage depot though this ceased in the late 1990s and the tanks were eventually demolished.Most of the area is now new housing apart from this particularly overgrown site. The adjacent school & schoolmasters house both built in 1790 were recently demolished after vandalism and a collapsed roof. The two rows of cottages built in the Dipping for chalk workers' family are long gone too. ​​West Thurrock is located 17.5 miles east of Central London. Thurrock is a Saxon name meaning "the bottom of a ship". The most prominent building in the area was Belmont Castle - a neo-Gothic mansion built c. 1795, surrounded by extensive pleasure grounds but was demolished in 1943 to make way for a chalk quarry. The area's large chalk quarrying and cement making industry, is today represented by the works of Lafarge below the Queen Elizabeth II Bridge. Other industry along the Thames includes a Unilever chilled distribution centre for products inc. Flora, Bertolli, I Can't Believe It's Not Butter, Stork & Peperami. A Procter & Gamble plant manufactures detergents and soaps. The 400 kV Thames Crossing is an overhead power line crossing of the River Thames, between Botany Marshes in Swanscombe, Kent, and West Thurrock.It's towers are the tallest electricity pylons in the UK. West Thurrock Marshes, on the Essex shore of the Thames Estuary just west of the Dartford crossing, is a brownfield site that has become important an refuge for endangered wildlife.The only British sites known to be home to more rare species than West Thurrock Marshes are Windsor Great Park and Dungeness both of these sites have been much more extensively surveyed than West Thurrock Marshes. ​During World War II, these small concrete forts/bunkers were used for the defence against a possible enemy invasion. Made of concrete that was sufficiently thick to be bullet proof. These were built in 1940-1941. 28000 pillboxes were built around the UK though less than 6000 still survive. The origin of the term 'pillbox' is uncertain - either a reference to the similarity of the fortifications to the cylindrical and hexagonal boxes in which medical pills were once sold or.... that they originally alluded to pillar boxes, with a comparison being drawn between the gunhole (loophole) and the letter-slot on the pillar (post) box. ​Grays is approximately 20 miles to the east of London on the north bank of the River Thames, and 2 miles east of the M25. The name "Grays" comes from Henry de Grai, a descendant of the Norman knight Anchetil de Greye, who was granted the manor of Grays Thurrock in 1195 by Richard I. The local football team is non-League club Grays Athletic. Sites of interest include the now-disused State Cinema and on Grays Beach is the site of the The Gull, a lightship built in 1860, which has lain on the foreshore for decades and has now virtually disappeared. ​The State Cinema opened in 1938 with a capacity of 2,200 and is a Grade II* Listed building after concerns that it would be bulldozed by developers. It was officially closed by Mecca in 1988 but an independent operator reopened it the following year as The Grays State Theatre showing films with an admission fee of only £1 though that closed down a few months later due to lack of revenue. In 1988 the State Cinema was a location shoot for a sequence in the film “Who Framed Roger Rabbit” starring Bob Hoskins. It reopened a couple of years later as Charlestons nightclub with The Merseybeats and Dave Berry and the Cruisers playing the opening night.Gigs by Suzi Quattro, David Essex, boxing matches and Sunday organ concerts, using the cinema's original Compton pipe organ, were also held until the club closed in 1998. The building was used for a music video by Jamiroquai for the song Deeper Under Ground which was used on the Godzilla film soundtrack. Later that year permission to convert into a Pentecostal church was refused. Morrisons then bought the site and built a supermarket on the cinema's car park then sold on the cinema building and deterioration set in. 2011 saw a break in resulting in the theft of metalwork and most of the organ's 500 pipes. Permission has recently been granted by pub chain JD Wetherspoon for a £3million scheme for the building to be repaired, refurbished and transformed into a bar complete with beer garden. "An honourable mention should nevertheless go to this poor ship moored on the Thames since 1947. She was built in 1860 and was in service with Trinity House for 80 years (Trinity House being the official General Lighthouse Authority). Believed to be the second oldest surviving lightship in European waters, she was attacked in 1941 by enemy aircraft and spent the rest of the Second World War laid up. She is now located next to Grays Yacht Club, who used it as a clubhouse until the 1970s. In 2002 vandals set light to the then-restorable hulk. Since then the ship has been left to rot. She is in a sorry state. The next storm may well be her last." In 2011 the ship was taken apart and the metalsold off for scrap, but the 75ft mast was rescued. The light mast in now pride of place at the top of the slipway of Thurrock Yacht Club and can be seen on the approach to the club while the rest of the boat has rotted and ravaged by the tides of the Thames. Then and Now photos can be seen in the Derelict London New Edition published in June 2019 via Penguin Random House Books. Commonly referred to as simply Southend is 40 miles east of central London. Southend-on-Sea is a bit of a misnomer, as technically it’s “Southend-on-Thames”, as the town is situated at the mouth of the Thames Estuary, with a view of the Kent coast. Southend's status of a seaside resort grew after a visit from Princess Caroline of Brunswick (Princess of Wales from 1795 to 1820) and Southend Pier was constructed - the longest leisure pier in the world. From the 1960s onwards, the town declined as a holiday destination, redeveloped itself as the home of the Access credit card, due to it having one of the UK's first electronic telephone exchanges. And much of the town centre was developed for commerce and retail, and many original structures were lost to redevelopment. However, about 6.4 million tourists still visit Southend per year. ​This empty former Methodist church building in Pleasant Road was for many years the factory of Grosvenor Confectionery run by a successful seaside rock-making family. 'What with health awareness and Brussels, the once sunny world of British seaside rock-making has become a greyer place' wrote Management Today magazine in 1996. Grosvenor diversified into other hard candy specialities - a range of lollipops including a naked lady, rock that resembles a cigarette and bespoke rock produced as a PR give-away for Lotus, Legal & General and the Queen fan club - the group, not Her Majesty. The factory eventually closed down in the early 2000s and the building suffered a massive fire in 2008 with flames shooting as much as 20 feet into the air taking 30 firefighters 3 hours to extinguish. Another fire occurred in 2016 when the derelict building that was full of old arcade machines. Ian writes to Derelict London: Hi Paul, I just wanted to say what a great site yours is. I've been a massive fan of it over the years and was pleasantly surprised to see photos of Southend (I live in Leigh on Sea) so they are very familiar to me. The pictures of the old rock factory in Pleasant Road are especially relevant to me as my father worked there through all his working life until he died in 1997. I worked there during the summer of 1978 in the school holidays to enable me to buy my first moped. Keep up the good work.